Imagine watching a classic mystery film or seasons of Lost while using a second-screen app that gives you unofficial insights and conspiracy theories as their plots move along. That’s the promise of Gracenote’s new audio fingerprinting API that allows apps to hear your TV so they can show you content related to the exact moment you’re viewing. Gracenote is also launching the “eyeQ API” which lets developers draw on local and national TV listings in 28 countries and 30 languages, as well as bonus content. It could let people build a better TV guide experience than the channel by time grid. I’d personally like to see guides sorted by popularity or what your friends are watching. It will demo the APIs at next week’s TV Of Tomorrow conference. Founded in 1998 and backed by Sequoia, you might know Gracenote from its technology for identifying song and artist names when you put you put a burned CD into iTunes. Its new “Entourage API” relies on a similar database of audio fingerprints, but for around one million films and television shows. The API takes the television audio pulled in from a user phone, tablet, or computer microphone and matches it against that database to tell the app the current timestamp of the video in progress. 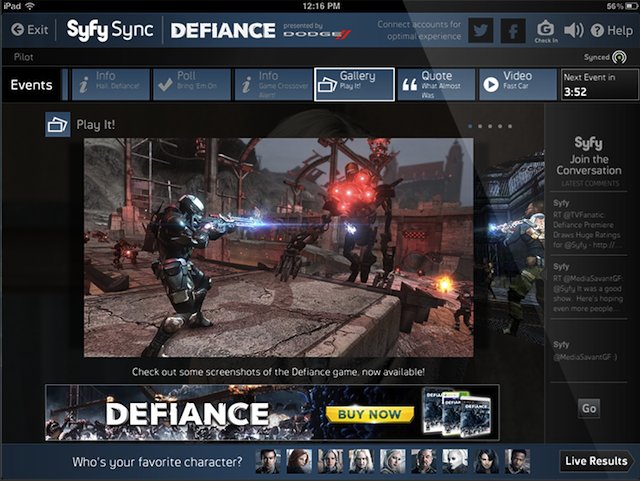 Companies like the Syfy channel are already using it to power companion apps like one for its new show Defiance, but I see even bigger potential for independent developers. It solves a big problem for second-screen app makers who’ve typically had to rely on audio watermarks to sync their apps to video. Watermarks are a crummy system for syncing. First, the content providers need to have watermarked their own videos. Some licensing agreements from the content owners don’t allow any modifications, and it takes work, meaning not everything you see on TV is compatible with watermark-based second screen apps. Audio fingerprinting also means you don’t need anyone’s permission to build your own TV companion apps. Provide your expert amateur analysis, build companion games, or do whatever you want. Technology is helping the public reclaim what was once purely a top-down broadcast medium and give it their own spin through the second screen.